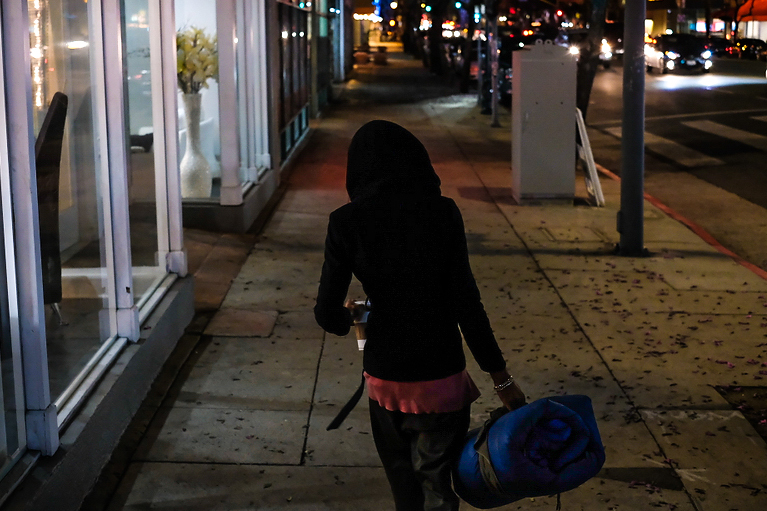 Nic Dumay has been homeless on the streets of Sherman Oaks for over a year. After completing a bachelor of arts degree in graphic design in the state of New York, he came back to his home city of Los Angeles homeless for reasons unknown. He has since been out of touch with family that lives close by, and he rarely accepts food or money donations. On most nights, Nic sleeps at this location near Ventura and Van Nuys Blvd., due to a soft stretch of astroturf that extends from a parking lot. 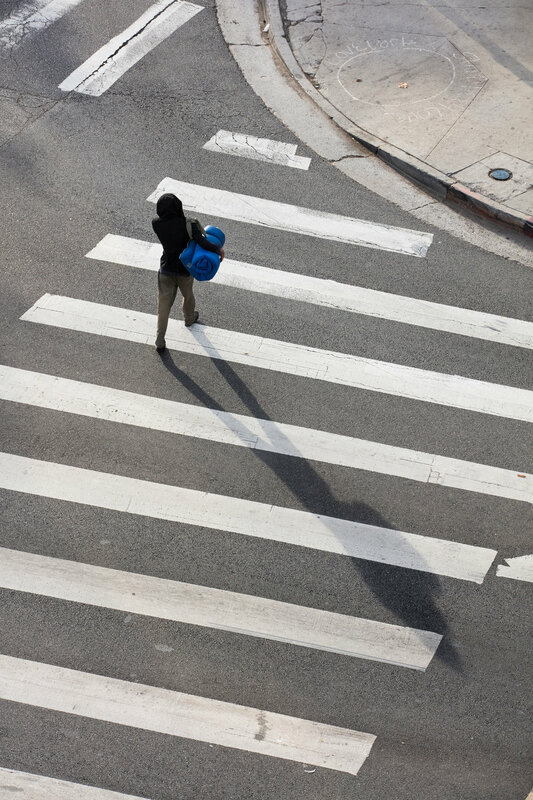 Nic Dumay crosses a busy intersection at Van Nuys and Ventura Blvd. walking in the direction of a Starbucks that he spends his mornings in. One a cold winter night, Nic found a spot to sleep in front of a musical instrument shop along Ventura Blvd. On most nights he prefers to sleep along an area with a soft strip of astroturf near Van Nuys Blvd. 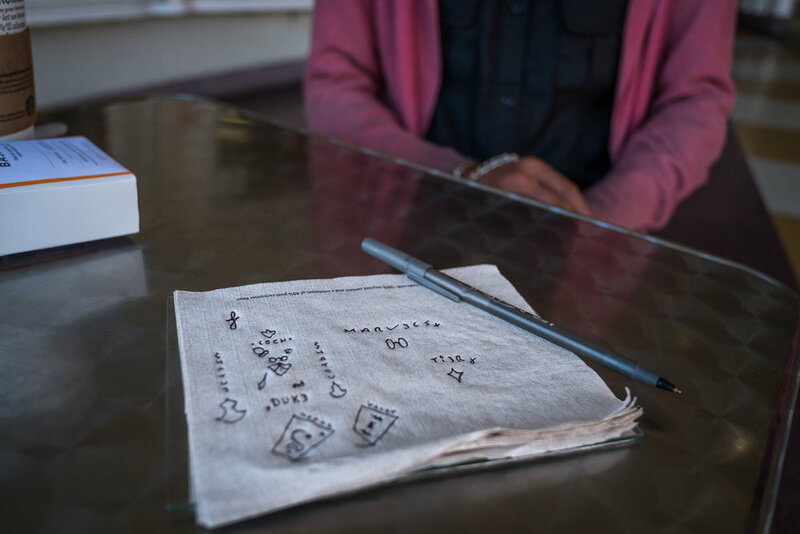 Nic is an individual with a knack for creativity, often drawing on napkins and piecing together articles of broken jewelry he finds on the streets of Sherman Oaks. He has been homeless for over a year. Nic can usually be found along Ventura Blvd. in the Sherman Oaks Village area. With a background in graphic design, he often draws on napkins from a Starbucks he visits in the early hours of the morning. Nic displays articles of broken jewelry he found and crafted together into once piece. A woman walking along Ventura Blvd passes by Nic sleeping in front of an empty retail space in Sherman Oaks, CA. In the mornings Nic spends much of his time at a Starbucks in Sherman Oaks, California, where he uses money he obtained the day before to buy himself coffee. With a background and college degree in graphic design, he continues his craft the best he can by drawing on napkins. Nic Dumay’s Twitter page features a photo of his former self; clean shaven, combed hair, and a website link that he used to market his graphic design skills. His website is no longer working. Nic does not roam far from the Sherman Oaks Village area. He rarely accepts offers for money or food, and has declined to be put in touch with social service outlets of Los Angeles County. He has recently begun talking to himself, and slowly gesturing to people he imagines; characteristics he did not have one year ago. His story continues, but for how long?